Ancient Frog is one of the few hidden gems the iTunes App store has to offer. It’s unique, elegantly designed, and leaves you with this amazing Zen-feeling while playing. What is it exactly? It’s an original puzzle game that makes you feel like you’re sitting in the middle of a rainforest. The object of the game is to help guide your frog from one part of the screen to the other to eat a delicious little fly. You control the frog by moving its legs, one at a time. The frog must stand in a natural way, so having it cross-legged wouldn’t work. To complete the level, all four legs must be in the target position in front of the fly. The first level is a basic tutorial that will teach you everything you need to know about the game. On the top right corner of each level is a daisy. Tapping on this will display the game’s options. Options include hints on the next move, skipping the level if you get stuck, or restart the level. The number in the daisy is the par number, which represents the least amount of moves it takes for the frog to reach its goal. The soothing sounds and peaceful landscapes make this the ideal game to help you relax. There’s no ticking clock to rush you through the level and you don’t have to worry about any lives being lost. The realistic graphics takes you out of your own environment and makes you one with nature. The game features 100 unique levels, 6 species of frogs, hours of replay value, a ton of beautiful environments and lighting, and soothing sounds of nature. This is a must-have game for a puzzle-lover. 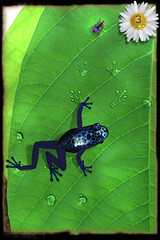 Ancient frog is compatible with the iPhone and iPod Touch and is currently in the iTunes App store for $4.99. A lite version is also available which features a few levels from each type of complexity, is also available for free. This article was originally published and featured in iProng Magazine.